The opening of the Wave at Emerald Glen Park in Dublin, California, has been awaited for quite some time. It is a multi-million dollar complex in the San Francisco suburb. However, on May 27, opening day, a 10-year-old boy was injured when he was thrown from a large water slide and fell onto concrete below. The child was treated at the hospital for scrapes and then released. The Emerald Plunge slide, from which the boy was thrown, and the Dublin Screamer chute next to it were both closed after being open for only about 90 minutes that Saturday. The California Division of Occupational Safety and Health are investigating what went wrong and why a rider would be ejected from the slide when it was being used properly. Along with authorities, the city is determining what improvements should be made to ensure rider’s safety and prevent future accidents. When visitors are injured at a water or amusement park, the owner of the park is not always liable. There are injuries associated with the risks of going to a water park, like slipping and falling on wet cement. However, there are times when a park owner can be held responsible for an individual’s injuries. Water park owners may be responsible for a visitor’s injuries under California premises liability law. Under this law, the park owners have a duty to keep the premises, including the rides, safe for guests and staff. To keep the premises safe, the owners must ensure all of the areas and rides are routinely inspected. If a hazard is found, it should be blocked from use, have warning signs, and be fixed as soon as possible. If a park owner does not conduct routine inspections, put up appropriate warnings, or fix dangerous defects, then they may be considered negligent and responsible for injuries these defects cause. 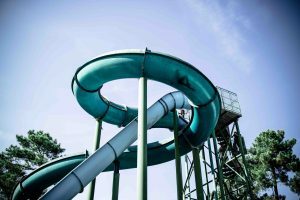 When an injury occurs on a ride like a tall and steep slide, the specific circumstances will determine whether the water park is liable. There are always risks associated with this kind of activity. A park owner is not responsible for a freak accident or when a guest is hurt because of misusing the slide. However, if the slide was defectively designed, improperly assembled, or had a hazard such as a loose segment or bolt, and this is the underlying reason for a visitor’s injury, then the owner may be liable. When a visitor is injured at a water park because of a dangerous designed ride, a hidden defect, or an employee’s negligence, then that individual should speak with a California personal injury attorney from Brod Law Firm right away. It can be difficult to determine whether a water park is liable or not, particularly when purchasing a park’s ticket may be considered a liability waiver. An experienced lawyer can review the situation and advise the injured guest on his or her rights and legal options. A guest injured at a water park may have the right to seek compensation through an injury claim or premises liability suit. For more information, contact Brod Law Firm today at (800) 427-7020.